The Qt launcher is an integrated launcher for FlightGear, replacing FGRun in the official distributions as of version 2016.4. Initially designed as a stop-gap solution in FlightGear 3.4 for the problem of support for the old FlightGear Mac launcher ending with OS X Yosemite, it has become FlightGear's main launcher for all platforms, and is shipped with all official FlightGear releases (however, users building from source may need to separately configure/rebuild FlightGear). Microsoft Windows: double-click the FlightGear <version> icon on the Desktop or click on Start > All Programs > FlightGear <version> > FlightGear Launcher. Note that the launcher is an optional feature for the reasons explained below in the Dependencies section. As a result, if you are on Linux and have installed the version of FlightGear provided by your distribution, it might not be available because the packagers might have not enabled it. In that case, ask your distribution to enable the feature. 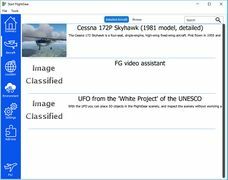 As of FlightGear 2016.2, the location used by the launcher to store downloaded aircraft and TerraSync scenery can be specified in the Add-ons tab. Specifying the TerraSync download directory manually has, thus, become unnecessary. the default preferences location on Linux (usually ~/.config/FlightGear/FlightGear.conf). Preferences can be reset to their default values by holding down the Alt key while starting the launcher. In October 2014, Apple released OS X 10.10 Yosemite. Unfortunately, one of the frameworks the old FlightGear Mac launcher relied upon, called RubyCocoa , was removed, making it incompatible with OS X Yosemite. James Turner started work on a solution for the then-upcoming 3.4 release. He added a simple built-in launcher using Qt, run before the main window would be created. It was released with FlightGear 3.4 as a Mac-only feature. After FlightGear 3.4, it was decided to that this temporary Mac-only launcher would be developed into a replacement for FGRun and that it would become part of the plan for updating the FlightGear user interface. 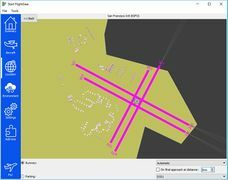 In FlightGear 3.6, it became available for all platforms, and has continued to be developed, enhanced, and refined. As of May 2016, the Qt launcher is under active development. This includes the adding of new features, fixing bugs, and refining existing features. As of mid 2016, the Qt UI is now also available at runtime; however, this needs a lot of testing, but aircraft can be installed / changed and location adjusted from within the sim. After some number of times the sim will crash. The Options which don't work are things like setting scenery / aircraft paths, and initial position, because those interfere with the values the launcher is passing itself. As of version 2016.4, FGRun has been removed from the official distributions. In addition, this was also motivated by the plethora of 3rd party GUI launchers/frontends developed by numerous contributors over the years . As for why the change, because the old one was Windows-only - the Qt5 thing works for Mac and Linux as well and allows to do things OS-independently, which is really conceptually superior as we don't need to deal with dedicated Win, Mac and Linux issues. The ultimate goal is to make it easy for hangar maintainers to distribute and integrate their work with the 'new' flightgear launcher (which has now been around long enough that it's hard to call new.) James's aircraft catalog system makes aircraft searching, selecting, and updating really easy and seamless for the end users. Aircraft [hangar] maintainers simply publish their catalog.xml (which is generated by the script.) A side effect is this system moves us away from dependency on fgaddon (or other even more massive repositories) and promotes smaller and more focused 3rd party repositories and a higher degree of decentraliation and scalability. See QtQuick use in FlightGear for the main article about this subject. However, it should be made clear that Qt will always remain an optional dependency. As of 05/2017, James is still very much undecided about which technology to use for in-sim GUI, he is somewhat inclined towards using the Canvas, because it avoids some rendering issues (but exposes a few more, + some performance ones) but the problem is James is fairly unhappy with the GUI / widget API in the Canvas right now - it does not satisfy his ideas about how simple + robust such an API should be, James needs to evaluate if the current API can be improved or needs to be drastically changed. The other issue is to use QtQuick rendered into OpenGL, which has a very nice robust and well-designed API, but adds some dependencies and complicates the rendering architecture, which makes him nervous about multi-window setups and other more esoteric OSG configs. There is 100% agreement that FlightGear will never require Qt, the intention is we’re adding integrated convenience features but the command line / shell environment won’t change and the default mode of ‘fgfs’ even in a Qt-enabled build is unchanged. You need set an env var or pass an argument to get the launcher, even if the feature was selected at compile time. We have the advantage that the Windows and Mac pre-built builds, it’s easy to ensure Qt is available, and those users are less likely to want complex command-line control than Linux users. And even if Qt is selected at compile time, it will still be possible to disable it at run time. That’s important because /initially/ it’s likely that some window-setup features won’t work when using Qt. 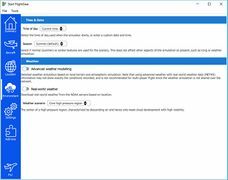 Especially the multi-window options for handling different projectors side-by-side. When the launcher was introduced, there were significant divergences of opinion regarding whether it was appropriate to require the dependency on Qt; the core developers concluded that it was undesirable, unless it had a specific benefit. Since, for the time being, Qt is only needed for the launcher, it has been made an optional dependency, and people can continue using other frontends should they wish so. 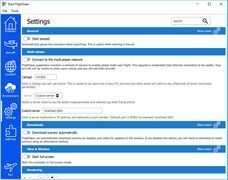 As of May 2015, the Qt launcher is the default on Microsoft Windows and OS X: in the case of Linux, it's up to the distribution packagers whether to include it or not. If, how and when the internal GUI can leverage Qt is under investigation and in such an early state that those responsible preferred to not announce anything yet. If this ever happens, this will be discussed on the mailing list. ↑ 1.0 1.1 James Turner (Apr 8th, 2016). 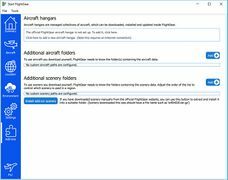 [Flightgear-devel] Launcher add-on handling changes. ↑ James Turner (Nov 23rd, 2015). 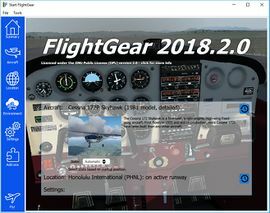 Re: [Flightgear-devel] Qt launcher and phi-utility FGFS 3.6.0 RC to	3.7.0. ↑ Thorsten (Jul 26th, 2016). Re: 2016.x.x take off from carrier . ↑ curt (Sep 2nd, 2016). Re: Jumbolino . ↑ curt (Jun 6th, 2016). Re: A call for FlightGear wiki logos for the 3rd party hanga . ↑ curt (Sep 7th, 2016). Re: How the project works . ↑ Torsten (Jan 10th, 2015). Re: New Canvas GUI. ↑ James Turner (Oct 11th, 2015). [Flightgear-devel] GUI questions (again). ↑ James Turner (May 28th, 2017). Re: [Flightgear-devel] KBOS runway list? are there 10 or are there 12? . ↑ Durk Talsma (2015-06-11). Re: [Flightgear-devel] Policy Document and V4.X Roadmap. ↑ Rebecca N. Palmer (Feb 26th, 2015). Re: [Flightgear-devel] FGData splitting / assembling the base package. ↑ Bertrand Coconnier (Feb 26th, 2015). Re: [Flightgear-devel] Qt launcher requirement bump in Flightgear git. ↑ Torsten (Jan 11th, 2015). Re: FlightGear GUI hell: PUI, Canvas GUI, Mongoose, Qt5 ? ?.